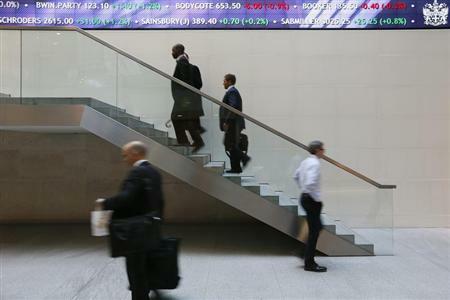 Asia stocks cheered as merger frenzy spurs Wall St.
SYDNEY (Reuters) - Asian share markets looked set for a bounce on Tuesday as Wall Street sped to historic highs amid more mergers buzz, while gold and oil prices extended their recent rallies. The upbeat mood among investors in the United States and Europe might help calm nerves about China after talk of credit tightening knocked property shares there on Monday. MSCI's broadest index of Asia-Pacific shares outside Japan <.MIAPJ0000PUS> added 0.1 percent while Australian stocks firmed 0.3 percent to reach their highest since mid-2008. Nikkei futures were up 1 percent, improving the chances that the cash index <.N225> will finally break back above the 15,000 barrier. On Wall Street, the benchmark S&P 500 hit an intra-day record as the Nasdaq punched to peaks last seen almost 14 years ago, when the technology bubble imploded. The Dow <.DJI> closed up 0.64 percent, while the S&P 500 <.SPX> gained 0.62 percent and the Nasdaq <.IXIC> 0.69 percent. In Europe, the FTSEurofirst 300 <.FTEU3> index of top regional shares added 0.64 percent. A surprise improvement in German business morale added to optimism over the euro zone's recovery and helped lift European shares. An one-notch increase in Spain's sovereign debt rating by Moody's Investors Service Inc also helped stocks in Europe. The latest U.S. economic data disappointed, but once again the weakness was put down to bad weather. Instead U.S. investors focused on a string of merger and acquisition activity that is pumping cash into the market and signaling growing confidence among business leaders. Radio frequency chipmaker RF Micro Devices Inc agreed to buy peer TriQuint Semiconductor Inc for about $1.6 billion, and Men's Wearhouse Inc raised its offer for Jos. A. Bank Clothiers Inc by more than 10 percent. U.S. Treasuries prices fell as money flowed to equities, but volumes were low. Yields on the benchmark 10-year note were at 2.74 percent, having edged up 2 basis points overnight. The swing in risk sentiment boosted currencies leveraged to global growth with the Australian dollar gaining over half a U.S. cent to $0.9032. The other majors were range-bound, as they have been for much of the past week. The dollar was heading nowhere at 102.49 yen, while the euro has settled in at $1.3732. Gold rose to a four-month high at $1,336.05 an ounce, adding to last week's gains and approaching October's peak at $1,361.60 which will be a major chart barrier. Brent crude was up 86 cents at $110.71 a barrel after production outages in Libya and South Sudan curbed exports and tightened global supply. U.S. oil dipped 17 cents in early trade to $102.65 a barrel, but that followed larger gains overnight on expectations that supplies would continue to drain from the benchmark delivery point for the U.S. oil futures contract.